ResMed's S7 Elite CPAP combines integrated humidification, compliance and efficacy data for both patients and clinicians, and a number of other features that produce optimal comfort, convenience, and patient involvement in CPAP therapy. Optional HumidAire 2i™ integrated heated humidifier provides a highly effective and highly affordable upgrade path for patients that require heated humidification. 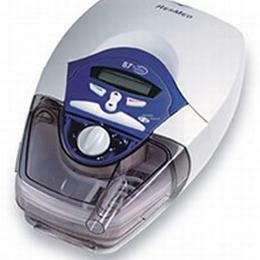 HumidAire 2i humidifier has a warm-up feature for patients who want full humidification the moment they start therapy. Smart Data™ has been designed specifically for patients who want to access the compliance data recorded by the S7 Elite CPAP (each device comes with a Smart Data diary for patient tracking of therapy). User-friendly LCD display with an intuitive menu makes accessing data and setting treatment specifications simple. SmartStart® automatically starts and stops the S7 Elite CPAP. Ramp setting allows patients to select a time interval for the gradual commencement of CPAP therapy. Automatic internal power converter enables trouble-free international travel. High-tech sound baffling makes the S7 Elite CPAP an extremely quiet device. Internal pressure sensor accommodates for altitude changes when traveling.